In an effort to improve public safety and reduce incidences of gun violence in Illinois, a bipartisan group of lawmakers has filed legislation that will help keep firearms out of the hands of individuals who have been deemed a public safety threat, have made threats of terrorism, or have been charged with an act of terrorism. The bill was unveiled at a press conference held at the James R. Thompson Center in Chicago on Thursday. 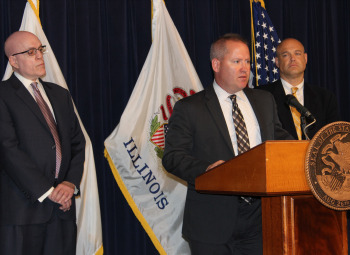 “I applaud the efforts of both Representative Ed Sullivan (R- Mundelein) and Representative Greg Harris (D-Chicago) for their work in presenting this commonsense and responsible legislation,” said House Republican Leader Jim Durkin (R-Western Springs). While providing law enforcement with an additional tool in the fight against gun violence and terrorism, the legislation also provides for a right to due process for those who have had a FOID card denied or revoked. In addition to the stronger provisions for screening FOID card applicants, HB 6588 also requires police chiefs and deputy chiefs to receive annual training concerning the FOID Act, the Concealed Carry Act, and firearms investigations. Since its filing earlier this week, nearly 30 members of the House of Representatives have signed on as co-sponsors.